I am very thankful for the opportunity to work with Dr Chen at his comprehensive ophthalmology private practice in Honolulu. He was a great teacher and host during my week there. I had the opportunity to learn a different clinic model and work with a very different patient population than I am familiar with. Dr Chen's practice is located in Downtown Honolulu. Most of his patients are immigrants, and he speaks Chinese to more than half his patients. Even though some of them speak English well, they prefer conversing in Mandarin or Cantonese as it makes them feel more comfortable and confident in his care. His patients have been with him for many years, and they are very appreciative of his care. Because many of his patients have limited financial means, he is mindful of patient expenses and tries to minimize their out of pocket cost. For example, he prefers to use a single incision astigmatic keratotomy rather than charge them for a toric lens. 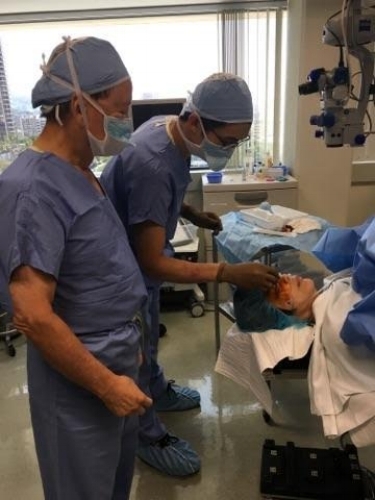 He has the ability to make intraoperative adjustments to his astigmatism corrections as he uses ORA for all his cases. Dr Chen focuses on the anterior segment and he currently has a strong interest in the diagnosis and management of dry eyes. One of his new techniques is to use cyclosporine drops with fluorescein strips. Because the drops contain glycerin as an emulsifying agent, the fluorescein remains on the cornea longer. This improves his ability to evaluate epithelial erosions and the tear break up time. Although he has been in practice for a long time, he is always looking for ways to improve patient care. Although he has a small staff, he is able to see about 30-40 patients today while also performing most of the diagnostic imaging on his own. For example, he uses fundus imaging to examine the retina and also document his exams. With the high prevalence of narrow angle glaucoma in his patient population, he is quick to reach to anterior segment OCT to confirm his suspicion. Overall, I had an excellent experience with Dr Chen. 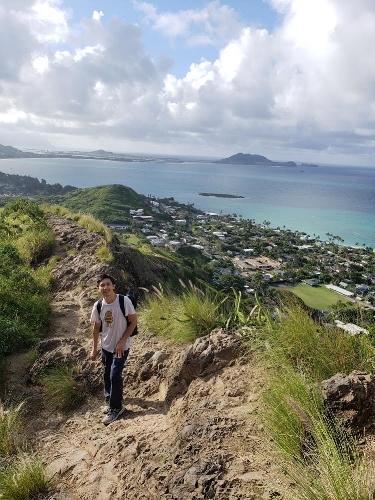 It was a great balance between learning about running a private practice and also enjoying the beauty of Hawaii.